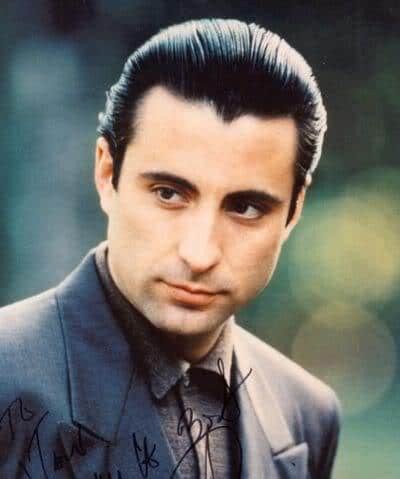 Andy Garcia is a Cuban-American actor who was born in Havana, Cuba April 12, 1956. His family moved to the United States when he was five years old and his father created a million-dollar perfume business. Garcia grew up in Miami, Florida where he attended high school. He is probably best known for his roles as Vincent Mancini in the movie, The Godfather Part Three, and as Terry Benedict in the movies, Oceans 11, 12, and 13. Garcia’s hairstyle is a medium length swept back look. The hair is layered from back to front getting gradually longer. That in this manner, when combed back the way he wears it, it gives his hair a fuller, thicker appearance. The hair is held in place by applying a small amount of gel or mousse while the hair is damp. To achieve a fuller look, blow drying helps to thicken the hair. Next, foaming pomade or styling gel is applied to produce the wet shiny appearance. This hairstyle is excellent for someone with straight hair and angular features. A person can make minor tweaks to the style as the hair grows back out until he has achieved exactly the look he desires.